I've written before about how great it is that our neighborhood is surrounded by nature and how accessible it is - but there are some days that it really continues to astound me (being the city kid I am) and how close we can get to some of the animals. 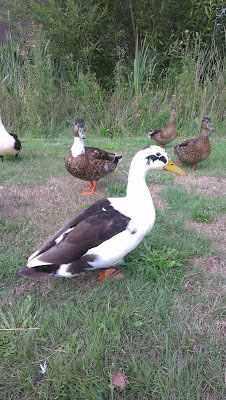 We've especially taken to the ducks that live in our neighborhood. 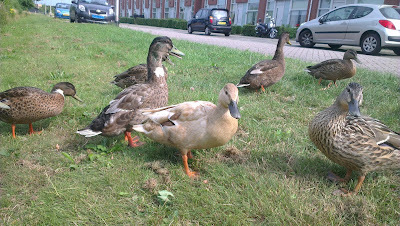 There's a small pond just a street over with more ducks living in or near the pond than you would find "in the wild." 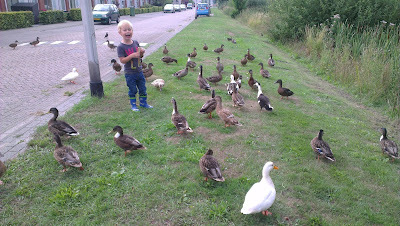 There's no way that the natural environment would support such a huge number of ducks in such a small area. It's possible here because the neighbors all at some time or another throw a bunch of stale bread out to the "wildlife." And the ducks stay around, because, who doesn't love free food? 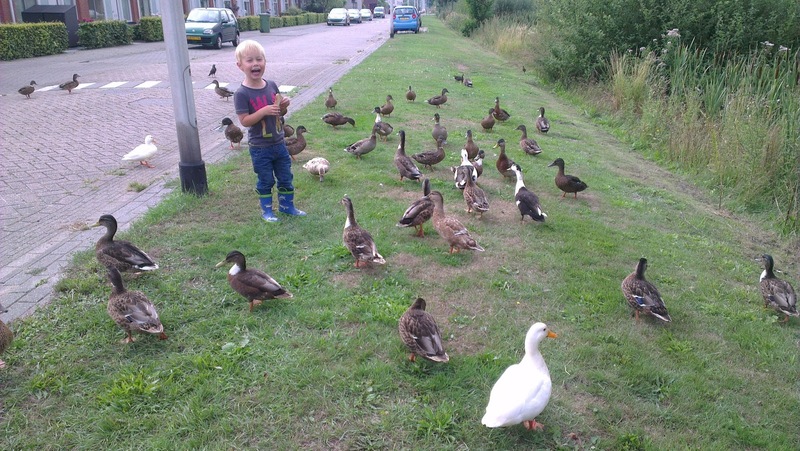 There are about 38 happy ducks (and one ECSTATIC Little Man) in this picture. About 12 more ducks didn't make it into the frame. But the story actually goes a little deeper for the ducks than just, "Hey, look, bread! Let's hang out here." One of our neighbors is a very sweet lady that might be described as "the duck lady." She has names for some of her favorites, she knows the mated pairs, and she knows which duck is the mother to somebody else. She knows these ducks. We got to know her because of Cathrine. Cathrine with her 3 week old ducklings. Cathrine is (you may have guessed) a duck. She's distinctive because she has very light brown feathers in comparison to the other ducks, and we saw a lot of her because she hatched 13 ducklings earlier this spring in the pond. While feeding Cathrine, we met the "duck lady," who proceded to tell us how she rescued and raised Cathrine as a duckling, released her into the pond, and helps Cathrine out by feeding each crop of ducklings. 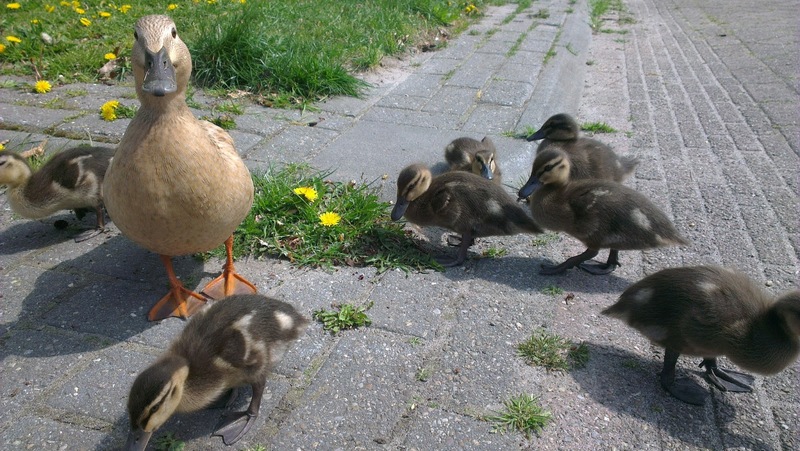 This turned out to be great for us, because Cathrine stuck around and we watched the ducklings grow and talked about how different kinds of birds care for their young. Cathrine with ducklings at about 8 or 9 weeks old. 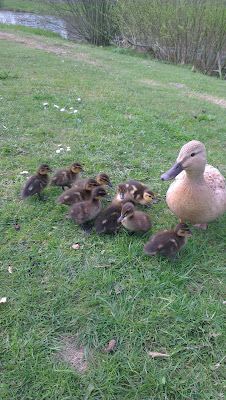 Cathrine with her grown ducklings. It's also great for us (and the ducks), because the ducks are half-tame. They know who the "regulars" are that come with a snack, and a few of the braver ones will eat out of your hand. Cathrine even comes when she's called. 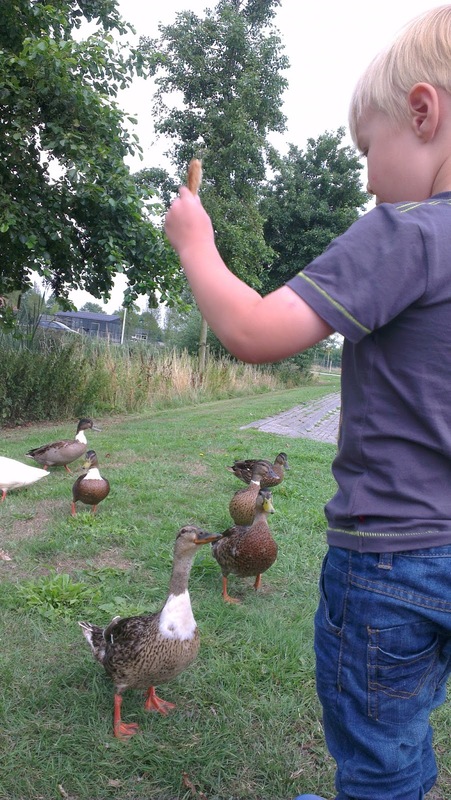 of the braver ducks that eats from the hand. And he's easy to identify. Generally, this is all good fun. We have fun watching some ducks, the ducks get food, and I feel like Little Man has developed a healthy respect for the animals. We'll see if they all stick around during the fall and winter. But until then, we'll keep taking the time to "visit" and make sure we bring a snack along.